Defining stakeholders enables users to enjoy a unique Experience in Bizagi. When users are defined as Stakeholders they are empowered knowledge workers with a personalized user experience whose Work Portal adapts to data changes to respond to their needs. For Bizagi, a stakeholder is a knowledge worker who will be logging in to the Work portal to carry out daily work, making relevant decisions, or similarly as in project management, to interact with the system and its information (e.g, view and follow up any case or structured information, or start new cases). Overall, end users are bound to have diverse interests in Bizagi, part from a different context, and not necessarily have the same use for certain options in the Work portal, stakeholders are how these end users are classified into groups, precisely according to how they interact with the system. Through the Work portal you can define which users belong to a particular group of Stakeholders. 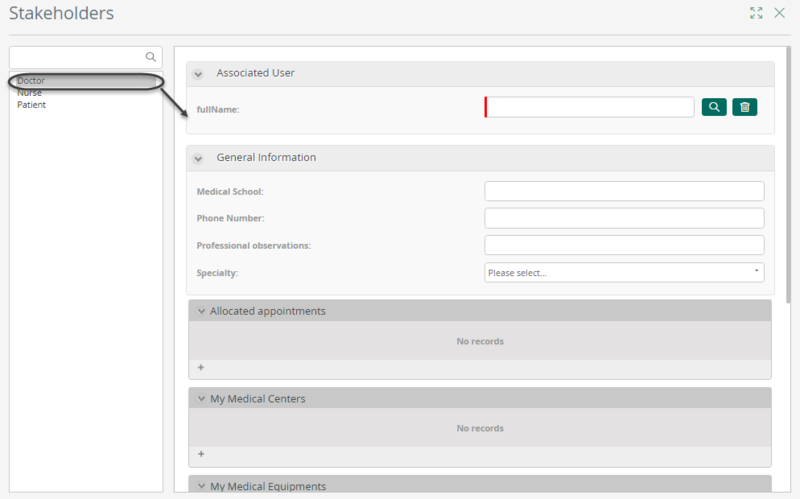 As soon as a user is associated to a stakeholder definition, the Me section will become the default view in the Work portal. Only users associated to a stakeholder definition will have the Me menu available. 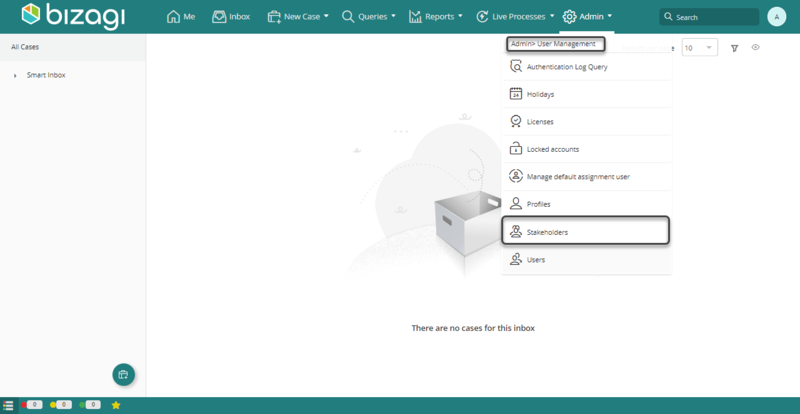 Thus, if a user is NOT associated to any stakeholder definition, the default view will be the Inbox. If your project has one or more stakeholder definitions, you can relate end users to one or more of them. To learn more about this feature, refer to Stakeholders. Click the Admin > Stakeholders menu option. You will see the Stakeholders window. This Windows is where an administrator manages each stakeholder definition, associating or removing users and editing its configuration. On the left, the list of all stakeholders definition is presented. When clicked, all records of the definition will display. The associatedUser attribute at the end of the table is the user associated with that particular stakeholder definition. 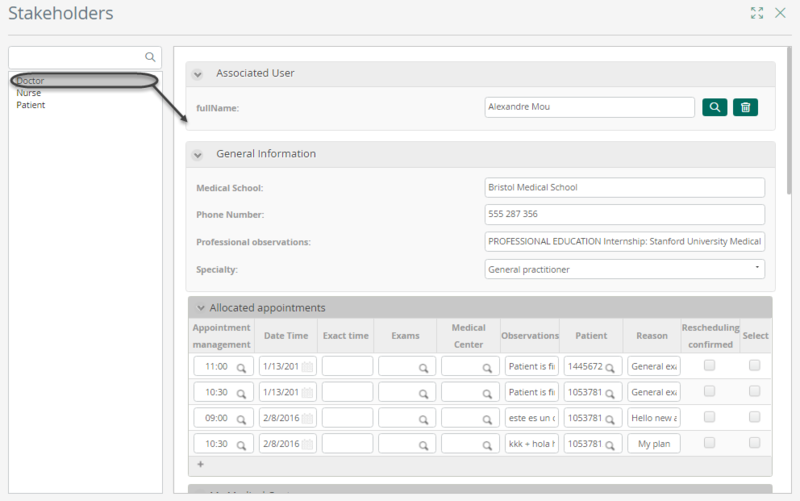 On the image below we can see four records of doctors, each with its own associated user. By default Bizagi will present an administration form with every attribute and collection up for edition. It is likely that you may want to customize such form and choose which attributes should be presented in this form. You may do so, and even define one form to add new records and a separate one to edit existing ones. •New Entry: Click new entry button on the Stakeholders main view. Use the Associated user control to browse over your users and select the one that will be associated. Fill-in all the required information in the form and click Save to finish. The Associated user is a mandatory field, because it makes no sense to have a record of a Stakeholder with no user associated. •Edit Entry: Click edit entry button on the Stakeholders main view. Edit all the information required in the form and click Save to finish.